BioSonic Repatterning, developed by John Beaulieu, N.D., Ph.D., is a natural method of healing using tuning forks based on the sonic ratios inherent in nature. When we tap the Pythagorean Tuning Digital Download or the CD. When we listen to these intervals we create an archetypal resonance resulting in a physical and psychic repatterning of our mind, bodies and spirit. This takes place on a physical level within the inner ear by stimulation of the cochlea and semi-circular canals. When we listen to the sound of the tuning forks our nervous system attunes to the pitch in much the same way as when we find a pitch for a choir, or tune a piano. The vestibular system via the semi-circular canals reproportions our body through a process of cellular memory based on the natural ratios of the tuning forks. During the listening process our physical body will actually reposture itself to hold the proportion and sound correctly. John Beaulieu discovered Body Tuners and the five element theorry of Ether, Air, Fire, Water, Earth to create a sound healing concert. For example, if you want to be more fiery you could work with intervals of C & E or C & A. If you want to be more watery, you could work with the intervals of C & D or C & B. 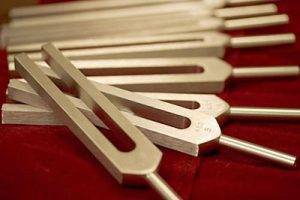 The tuning forks are tools to help you develop and refine your sonic abilities. Simply tap the tuning forks on your knees, bring them to your ears, and listen to the sound. When you tap the two forks together, the sound created is an interval. As you listen to the two different tones your body will naturally adjust itself and come into balance, making the two sounds into one. You can hum and let your voice resonate with the sound of the interval. This humming creates a sonic anchor which helps you recreate the experience of the tuning forks without having to use them. With practice you will be able to sonically “think” an interval and your nervous system will respond. When this happens your ears rather than your eyes will dominate your perception. Over a period of time you will naturally begin ?seeing? and feeling intervals everywhere in your life. You will be able to know through visual harmonic perception what interval a person is tuned into. Then through bodywork, tuning forks or other modalities you can help a person align themselves to intervals for healing and well being. When they are repatterned to the interval you will feel a resonance in your body similar to that of humming with the tuning forks. For a more information about BioSonic Repatterning read Dr. John Beaulieu’s pioneering book Music and Sound in the Healing Arts.